For more than 25 years, the Americans With Disabilities Act (ADA) has knocked down barriers that prevented disabled people from fully participating in society, and made physical locations from public parks and buildings to sports stadiums more accessible to everyone. The ADA was so effective in its mission that it’s difficult to find a location today that hasn’t been built or retrofitted for accessibility. But the Internet Era introduced a new accessibility issue that any business with a website needs to address. 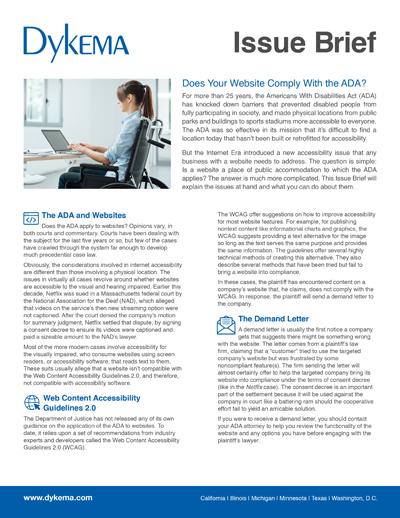 The question is simple: Is a website a place of public accommodation to which the ADA applies? The answer is much more complicated. This Issue Brief will explain the issues at hand and what you can do about them. Dykema regularly assists clients with all issues related to the Americans With Disabilities Act, including “digital barriers” cases and other matters. We can help you respond to any demand letter you receive or perform a WCAG compliance audit so that you are ready to defend yourself if one arrives. For more information on matters related to the Americans with Disabilities Act and/or performing compliance audits, please contact Laura Worsinger (lworsinger@dykema.com), Tom Alleman (talleman@dykema.com) or your Dykema relationship attorney.